Dynamic fitting is the most realistic. We record your riding position while you are in motion, giving a realistic picture of your pedal stroke and body position when out on the road and trails. RIDING a bike is very different to SITTING on a bike. Capturing your riding data dynamically gives a clearer, more accurate picture. Biomechanics are best assessed in 3D, this enables us to see how all of the applicable body movements are working together. 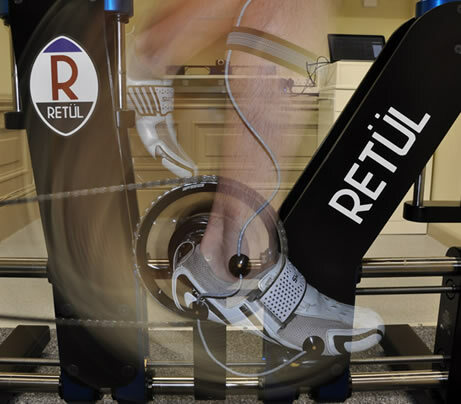 Retül’s motion sensors simultaneously gather data on multiple angles in 3 dimensions, so we can see measurements such as hip and knee angles, but also lateral knee tracking and hip lateral travel, the traditional 2D methods (video) falls somewhat short in this respect. Measurement accuracy is vital, the difference of millimetres can drastically change the feel of a ride. Small adjustments can make a big difference in alleviating back, knee, hip or neck pain. These adjustments will improve your performance. The Retül system is accurate to within less than a millimetre, creating true objective data which we utilise for perfect biomechanical fit.